Umm...hello and goodbye September?! That was fast. Who yelled "Vegan Power" while breaking a world record? News to restore your faith in sanity and humanity! A supplement I'm making my man take after his maniacal workouts. I'm hooked on these—packing iron, magnesium, calcium, B2, and more. Request them at your local health food store. Make any chicken noodle soup recipe vegan by using Chicken of the Woods. No one will know the difference! Word is spreading! Gotta see this, this, and this. First glance won't tell ya, but this is a win-win for soda companies. Come on, FLOTUS! 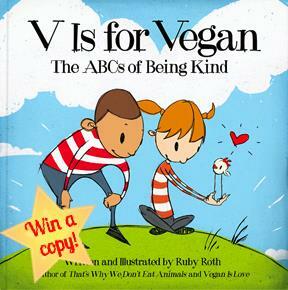 Win a signed V Is for Vegan book plus a sticker pack by picking me, Ruby Roth, on Team Cluck between now and Oct. 2 for Farm Sanctuary's "What Did You Do?" campaign! Donations will be matched!